DEVELOPMENT NEWS 24 • SHOPPING CENTER BUSINESS • June 2018 JACKSONVILLE, FLORIDA CORDISH COS., JACKSONVILLE JAGUARS TO CO-DEVELOP $2.5 BILLION MIXED- USE PROJECT AROUND EVERBANK FIELD The Cordish Cos. has been selected to co-develop a $2.5 billion mixed-use village surrounding EverBank Field, home of the National Football League's Jacksonville Jaguars. 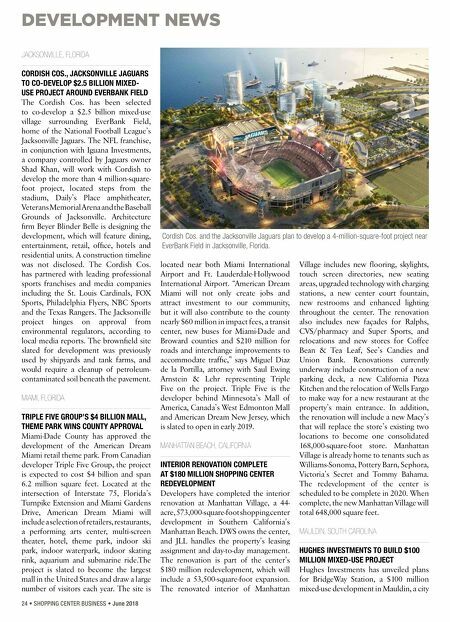 The NFL franchise, in conjunction with Iguana Investments, a company controlled by Jaguars owner Shad Khan, will work with Cordish to develop the more than 4 million-square- foot project, located steps from the stadium, Daily's Place amphitheater, Veterans Memorial Arena and the Baseball Grounds of Jacksonville. Architecture firm Beyer Blinder Belle is designing the development, which will feature dining, entertainment, retail, office, hotels and residential units. A construction timeline was not disclosed. The Cordish Cos. has partnered with leading professional sports franchises and media companies including the St. Louis Cardinals, FOX Sports, Philadelphia Flyers, NBC Sports and the Texas Rangers. The Jacksonville project hinges on approval from environmental regulators, according to local media reports. The brownfield site slated for development was previously used by shipyards and tank farms, and would require a cleanup of petroleum- contaminated soil beneath the pavement. MIAMI, FLORIDA TRIPLE FIVE GROUP'S $4 BILLION MALL, THEME PARK WINS COUNTY APPROVAL Miami-Dade County has approved the development of the American Dream Miami retail theme park. From Canadian developer Triple Five Group, the project is expected to cost $4 billion and span 6.2 million square feet. Located at the intersection of Interstate 75, Florida's Turnpike Extension and Miami Gardens Drive, American Dream Miami will include a selection of retailers, restaurants, a performing arts center, multi-screen theater, hotel, theme park, indoor ski park, indoor waterpark, indoor skating rink, aquarium and submarine ride.The project is slated to become the largest mall in the United States and draw a large number of visitors each year. The site is located near both Miami International Airport and Ft. Lauderdale-Hollywood International Airport. "American Dream Miami will not only create jobs and attract investment to our community, but it will also contribute to the county nearly $60 million in impact fees, a transit center, new buses for Miami-Dade and Broward counties and $210 million for roads and interchange improvements to accommodate traffic," says Miguel Diaz de la Portilla, attorney with Saul Ewing Arnstein & Lehr representing Triple Five on the project. Triple Five is the developer behind Minnesota's Mall of America, Canada's West Edmonton Mall and American Dream New Jersey, which is slated to open in early 2019. MANHATTAN BEACH, CALIFORNIA INTERIOR RENOVATION COMPLETE AT $180 MILLION SHOPPING CENTER REDEVELOPMENT Developers have completed the interior renovation at Manhattan Village, a 44- acre, 573,000-square-foot shopping center development in Southern California's Manhattan Beach. 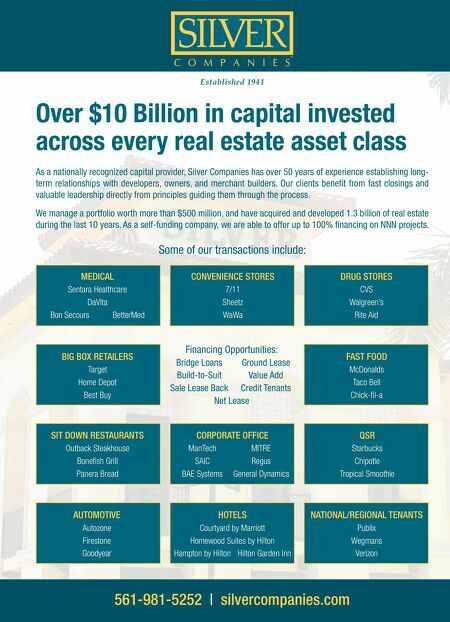 DWS owns the center, and JLL handles the property's leasing assignment and day-to-day management. The renovation is part of the center's $180 million redevelopment, which will include a 53,500-square-foot expansion. The renovated interior of Manhattan Village includes new flooring, skylights, touch screen directories, new seating areas, upgraded technology with charging stations, a new center court fountain, new restrooms and enhanced lighting throughout the center. The renovation also includes new façades for Ralphs, CVS/pharmacy and Super Sports, and relocations and new stores for Coffee Bean & Tea Leaf, See's Candies and Union Bank. Renovations currently underway include construction of a new parking deck, a new California Pizza Kitchen and the relocation of Wells Fargo to make way for a new restaurant at the property's main entrance. In addition, the renovation will include a new Macy's that will replace the store's existing two locations to become one consolidated 168,000-square-foot store. Manhattan Village is already home to tenants such as Williams-Sonoma, Pottery Barn, Sephora, Victoria's Secret and Tommy Bahama. The redevelopment of the center is scheduled to be complete in 2020. When complete, the new Manhattan Village will total 648,000 square feet. MAULDIN, SOUTH CAROLINA HUGHES INVESTMENTS TO BUILD $100 MILLION MIXED-USE PROJECT Hughes Investments has unveiled plans for BridgeWay Station, a $100 million mixed-use development in Mauldin, a city Cordish Cos. and the Jacksonville Jaguars plan to develop a 4-million-square-foot project near EverBank Field in Jacksonville, Florida.